TRMX-3 30TH ANNIVERSARY is a first grade sap sheet with 70% Tourmaline. With inclusion of 186% more extra Sporopollenin. TRMX-3 30TH ANNIVERSARY is recommended for these symptoms: Fatigue, headache, double vision, blood pressure, arthritis, rheumatism, skin problems, stress, slow learning, hot flashes due to menopause, mood swings, crohn's disease, fibromyalgia, and heavy metal poisoning. 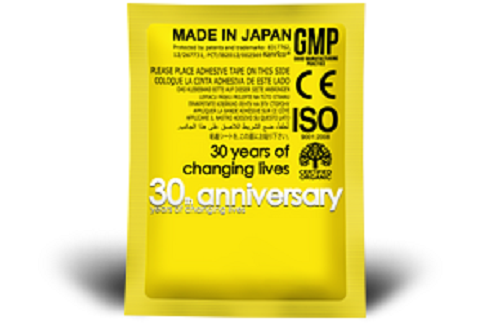 TRMX-3 30TH ANNIVERSARY is intended for patients that require immediate attention and immediate relief of the symptoms. The TRMX-3 30TH ANNIVERSARY contains a dosage of 8.5 grams (6.00 grams of TOURMALINE and patented SPOROPOLLENIN - patent 7,182,965, patent 4,485,940 and patent 03720506.09) and emits negative ion on the average of 3700 ion/cm3. The TRMX-3 30TH ANNIVERSARY contains 186% more sporopollenin than the normal TRMX-3. The inclusion of SPOROPOLLENIN further enhances the effectiveness of TRMX-3 in cleansing heavy metals. Sporopollenin, made with processing method of patent 7,182,965, is found to remove abundant quantity of heavy metals very effectively ( 99% removal of Pb, 83% removal of Arsenic, 62% to 65% of removal of Cadmium). The inclusion of Sporopollenin in the TRMX-3 makes TRMX-3 the most potent sap sheet in the century for heavy metals removal. In March 2011 and May 2013, clinical studies confirmed its efficacy in the treatment of physical and mental fatigue. Its efficacy in heavy metals removal have been completed with the clinical studies conducted in January and October 2005.